That is very interesting analysis. I’m impressed. I like the puzzle concept and believe your learning curve will taper off and then if you keep at it will surge at some time. Thanks Bete! I think you’re right that I have to be prepared for plateaus at some points in the process. “The sounds of a language that was once utterly foreign to me have now become familiar” — that’s a good sign, as was your being able to recognize some overheard conversation as being Mandarin a few months ago (week 27). I’ve spent a lot of time listening to spoken Thai that I can only understand a little (or sometimes nothing) of, but even still you can often catch something of what’s going on, even if it’s just a kind of non/sub-verbal emotional exchange. Anyway, I like how other languages sound. What do you think about the usefulness of listening to content of which you understand very little, i.e. mostly incomprehensible input? The reason I ask is that, if I understood correctly, ALG frowns upon this, and seeks to have all content be in the 70% comprehension range. In a language learning forum I participate in, most all the participants also seem to think that listening to incomprehensible input is a waste of time. I, on the contrary, think it is quite useful as long as it done with full attention–in fact, that’s a premise of my project. That’s an interesting question…the big questions for me are, at/below what percentage comprehension-wise is input useless? At what percentage (range) is it optimal? I don’t think there are any answers to these questions as yet, so if you want to experiment on yourself, I for one look forward to reading about your experiences and progress. I certainly sat through my fair share of classes in AUA where my idea of what was going on was really vague, sometimes practically nonexistent. This usually happened in the early phases of being at a new level of class; eventually, my comprehension would come up. So obviously, getthing that “very low comprehension input” worked in terms of acquiring Thai; whether getting “higher comprehension input” at that point would have accelerated the learning process — that, I don’t know. I’ve also sat through snatches of dialogue or scenes in TV shows and movies where my comprehension has been extremley low — occasionally entire shows or movies; these are harder to assess in terms of their efficacy as language learning tools, at least in part because they were just one element in a mix of more comprehensible input (easier to understand shows and movies, classes at AUA). Most of the TV I’ve watched has been lakorn — Thai soap operas — where it’s very easy to get at least some idea of what’s going on, even when the language is problematic. My hunch is that certain kinds of totally incomprehensible input really are totally (or almost totally) useless. My list would include things like the following, where the language is so advanced as to be totally incomprehensible to the listener/viewer: audio only, and especially something like a recording of a university lecture, where you’re just getting an information monologue delivered in a fairly monotone, unemotional voice; and shows where the visuals have little or nothing to do with the language used, there’s no easy to follow narrative, there are no obvious emotional interactions between people — stuff like “high level” news shows (politics, economics), or talk shows about similar topics (with “talking heads”); and maybe certain types of documentaries. Basically, I’m talking about situations where the input consists of language that’s way out of your reach, and the context and nonverbal side of things don’t really provide any real help in terms of “getting” what’s going on. I think you need to be able to have some understanding of what you’re experiencing, in order for that experience to be an instance of language learning — but it doesn’t have to be a very high level of understanding; it could be pretty vague. A key idea behind comprehensible input is that if your language capabilities are weak, then you need to have things like context and nonverbal cues. Good stuff for beginner level — if you’re limited to video — might be shows that demonstrate things and talk about them at the same time (cooking, crafts); I’m big on soap operas, but by the time I started really trying to watch them, I was already at a fairly decent level of Thai (around 1750 hours class time, I think, plus a fair amount of out-of-class experience) — though in retrospect, I probably could have started watching them earlier. Here’s a thought experiment of mine: totally incomprehensible input: an audio recording of someone reading, in a flat tone of voice, a series of vocabulary words, or even phrases, that don’t add up to anything meaning-wise; i.e., they don’t form any kind of narrative or information or communication, just instances of the language itself. My guess is that that kind of input would get you nowhere in terms of language acquisition — it would be a waste of time; if it were the only form of input you were getting, you’d never learn the language. So again, for me, the questions are: how low of a level of comprehension could you get away with and still be learning; what level of comprehension would be optimal in terms of maximal learning? Then there’s also always the question of enjoyment. If what you’re getting is totally, absolutely incomprehensible (like in the example I give above), you might find that your ability to enjoy it fades away after the novelty wears off — and there’s nothing there to really hold your attention. But even a fairly low level of comprehension can make for an enjoyable experience. For example, you’re watching a scene in a movie or show, and you understand that these 2 people have a conflict going and are having a showdown; something is at stake. You can’t figure out what is at stake, what’s going on, or what they’re saying to one another; but you get the scene on an emotional level. — I’ve been through this plenty of times watching movies and TV in Thai, and I enjoyed what I was watching and it wasn’t a chore to keep paying attention, despite the extreme “sketchiness” of my understanding. That’s a really complete answer and I will reference it in the future, as I think you really hit the nail on the head. In your implied (and much more logical) definition of incomprehensible input, an example of which is pure audio when one is just beginning to learn a language that is unrelated to languages one already knows, I agree that its usefulness is limited at best. And in that definition, none of what I’m listening to is actually incomprehensible input, since I always have rich visual cues and can get the gist what is going on. A good example is the cartoon Boonie Bears. At the beginning of my experiment, an entire episode could go by without my recognizing any words. Nonetheless, I understood the basic plot. And in many episodes I was able to pick up a word here and there. Even the hardest material–such as movies without any subtitles–is not really incomprehensible in that strict sense. Some of the strongest critics of my experiment (namely on forums), however, consider my watching these sources to be incomprehensible input and thus a waste of time. 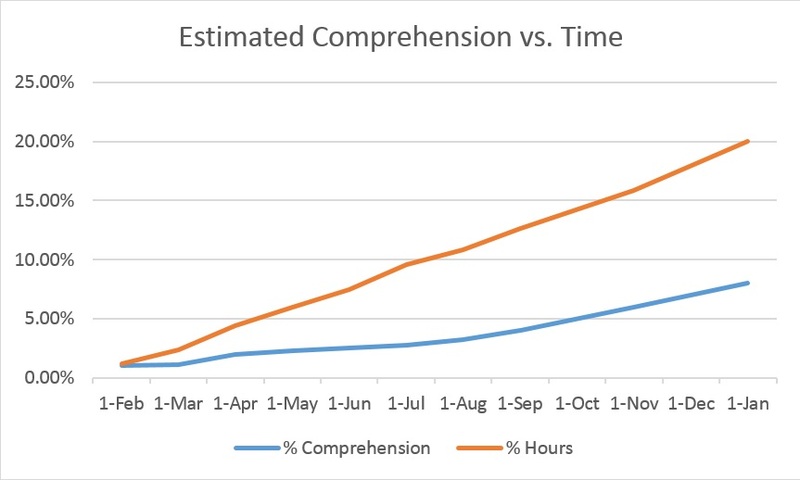 As you say, a very interesting question is what is the optimal percentage of comprehension for learning. I would venture to guess that, while there might be an optimal point (which would probably vary depending on each person, L1 and L2, etc. ), the benefits of watching with full attention at any rate of comprehension would not decline very significantly as compared to that optimal point. It’s actually probably optimal to mix things up, since you might glean different benefits at different levels. For instance, and just for the sake of argument, watching at 80% comprehension might be fantastic for picking up new vocabulary, at 98% might be best for strengthening one’s grammar, learning idiomatic expressions, contributing to spoken fluency, etc., and at below 10% might be really good (for beginners, by definition) for learning high frequency vocabulary, paying attention to phonemes and cadence, etc. In the case, and in line with what you suggest, better criteria for choosing what to watch might be simply what you enjoy more, feel motivated by, what is easily available, what contributes to your life in other ways beyond language acquisition, and so forth. “I always have rich visual cues and can get the gist what is going on” — that’s comprehensible input, in my book. “Comprehensible input” to me means getting the overall meaning; it doesn’t mean that you have to understand every detail, as you would with a language that you’re totally fluent in. Mixing things up is good for fun, for getting different types of language (a kids’ show vs. the nightly news vs. a soap opera; dialogue vs. monologue, etc), for covering different topics (and their associated sets of vocabularies). I’ve sometimes watched stuff that’s way over my head — just as an experiment, for the sound of the language, for exposure to the particular type or register of language they’re using; but I usually find that I can’t sustain it, and end up setting those kinds of shows aside, to maybe pick them up again at some future point. Oh, and regarding the “comprehensible” in “comprehensible input”: it refers to understanding the situation as a whole, not just the language; language is only one facet. So if you’re following what’s going on — in a Boonie Bears episode, or while talking to a native speaker who’s willing to supplement their speech with gestures, pictures, etc. — then it’s “comprehensible” even if you can’t understand a word of what’s being said. “Traditional” language learning is I think premised on the idea that you need to learn all the vocabulary (and grammar rules, etc) before you can understand an instance of the language being used; ALG/natural language learning is assumes that if you can follow what’s going on in a situation where language is being used, you will end up acquiring language. So it kind of reverses the logic and assumptions of more “studious” language learning methods. As you acquire more and more of your target language, you become less and less reliant on context and nonverbal cues to make the input comprehensible; you can get to the point where you can understand input that consists of nothing other than language. I will definitely check it out, even though it’s not a genre I tend to like. Where exactly do you watch it? Online, streaming, purchase? Tons of free shows on Viki, subbed in multiple languages.